The Hockey Show, Canada's only campus-produced radio show that strictly talks hockey, continues with the Summer of Interviews tonight as we bring back another guest who we really enjoyed having on the show the first time. She's a champion, she's earning her PhD in awesomeness, and she's doing amazing things in nature and in her community. It isn't often we get to chat to someone who hoisted hardware, but we're happy to be doing that tonight! Beans and I get to welcome back the woman on the left as we first spoke with her on March 3, 2016 in Episode 180. At that time, she played for the Brampton Thunder which has since become the Markham Thunder which has since won the Clarkson Cup! Tonight, we welcome back CWHL champion Fielding Montgomery as we get caught up on her season, her experiences in China as a player, her PhD work as she earns her Master's Degree, her sister who is just as awesome as she is, and the amazing things she's doing in the community as a member of the Thunder! Fielding's last couple of years have been busy, so we're happy to get an hour with her to talk about all the amazing things she's doing! "Hey, I know Fielding! I wanna listen!" you say. Well, the easiest way is for you to download the UMFM app on your phone or tablet. It's literally the most convenient way to listen to any of UMFM's great shows any time of the day, so go get it! Just follow this link on your iDevice or this link for your Android device and get the UMFM app! It's never been easier to tune into The Hockey Show or UMFM! Download the UMFM app today, and don't miss any of our great programming or shows! Of course, you can do the radio thing at the 101.5 frequency on the FM dial and you can always listen online via the UMFM website as well! If you prefer social media, we try to remain up-to-speed there! Email all show questions and comments to hockeyshow@umfm.com! Tweet me anytime with questions you may have by hitting me up at @TeebzHBIC on Twitter. You can also post some stuff to Facebook if you use the "Like" feature, and I always have crazy stuff posted there that doesn't make it to the blog or show. 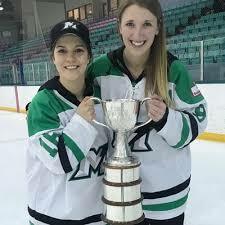 Tonight, Beans and I talk with Fielding Montgomery about the Thunder, winning the Clarkson Cup, getting her PhD, some great community initiatives she is part of, and more only on The Hockey Show found exclusively on 101.5 UMFM, on the UMFM app, on the UMFM.com web stream! Does It Snow Anywhere Else?